Some say your key ring indicates your level of importance. I think my key ring indicates my life is far too complicated. I have too many cars to repair, maintain and fill with gas. I have access ( and responsibility ) of more than one house. Multiple pad lock keys indicate access ( and responsibility ) to private information and/or more buildings. Membership to Gibson’s Gym and Easton Yoga. There was a time when I had only four keys on my key ring. One unlocked the front door to the building where I lived in my studio, the entire seventh floor at 101 Broad Street in Boston. One unlocked the door to my studio. The other two were for my bike, one for the kryptonite lock that secured the bike to a pole and one for the chain lock that secured my front wheel to the bike. Life was simpler then, even though I didn’t think so at the time. 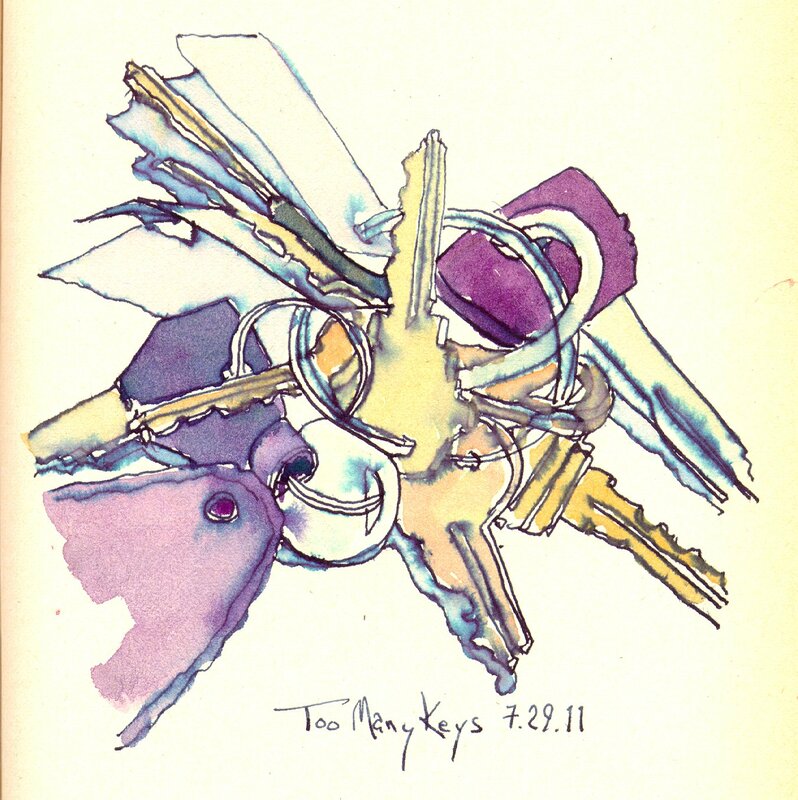 Sketch: Drawn first with Noodler’s Flex Fountain Pen filled with Noodler’s Midnight Blue Ink, followed by watercolor. Complementary Color Scheme of yellow / purple taking advantage of the natural color value range of yellows and purples. A value study in grays can come to life with a stroke of color, especially red. This old, Hercules bike pedal was among the treasures of junk found in the attic of the house my family built in 1952. Somehow it survived the dumpster by two votes, mine and my brother’s. Now that I have drawn it I will send it to New Hampshire. Why? I haven’t the slightest idea. Some things are just meant to be cherished a little longer. I’m experimenting with the old Marvy 1300 markers I found tucked away in a closet. 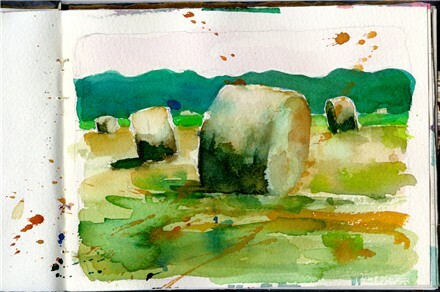 I want to be able to add color without the drying time necessary for watercolor. I’ve not been a great fan of markers and colored pencils are way too tedious for me. 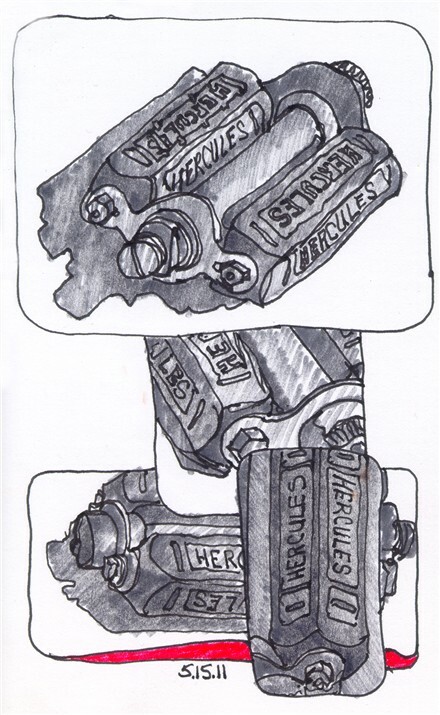 I used a somewhat dried out gray #12 for the rendering of the pedal after doing the drawing with my Parker 51 fountain pen. The extraneous shape at the bottom of the lower rectangle begged for a bit of flare, so I added the bright red #2. I’ve always liked the way that black and red bring out the strengths of one another. Aside from the fact that it looks as if it might fall off the lift, I like this one. Bob's Truck on the lift, waiting for a new transmission. I’ve spent a fair amount of time at Tony’s Auto in Washington, NJ lately. 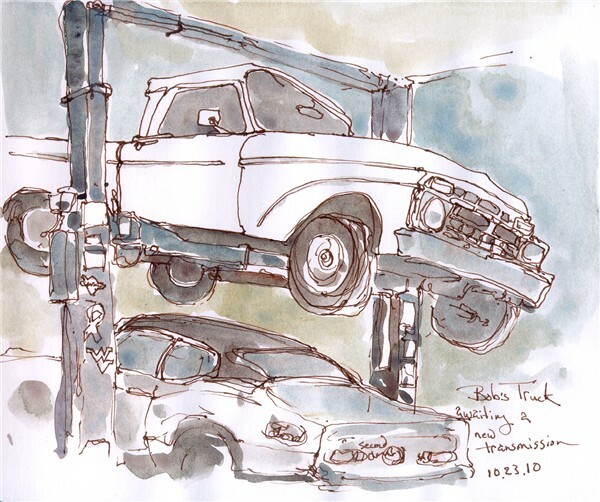 After watching me sketch Ed working on my K-car, Bob asked if I would do a sketch of his truck. I was delighted. A fountain pen and a bit of watercolor can express so much when the values ring true. A bit of warm color and a bit of cool color create the illusion of a more expanded palette. 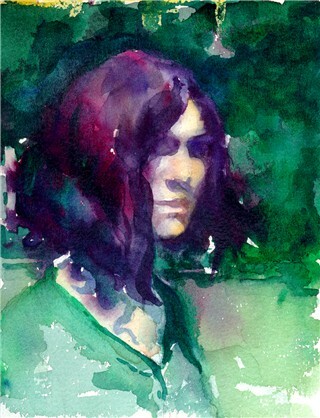 There is simply no excuse not to paint everywhere I go when I can get by with such simple tools and a sketchbook. And …… the mysterious problem of the high idle appears to have been solved, though we are not sure how it was solved. I’m not sure if Rick meant the Winsor Green Yellow Shade or the Winsor Green Blue Shade. Most likely it was the Blue Shade. When I dug through my paints I found both. The Blue Shade was hard as a rock so I opted for the Yellow Shade. The above exercises are the result of a recent blog dialogue discussing mixing darks rather than using black from the tube. 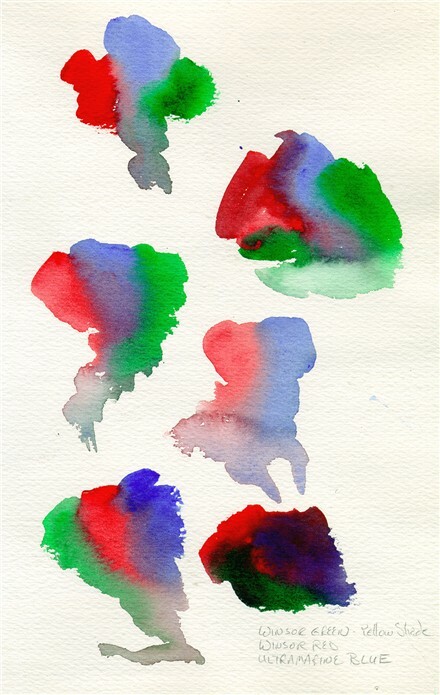 The Winsor Red and Winsor Green were still on my palette the next morning when I did a quick watercolor sketch of the Bittersweet bush outside the window in the gray light of a misty morning. I have to admit that I liked mixing the two for my darker, warm greens behind the cool-colored leaves. The fifth color exercise is now posted. Link to Color Exercises Directory. 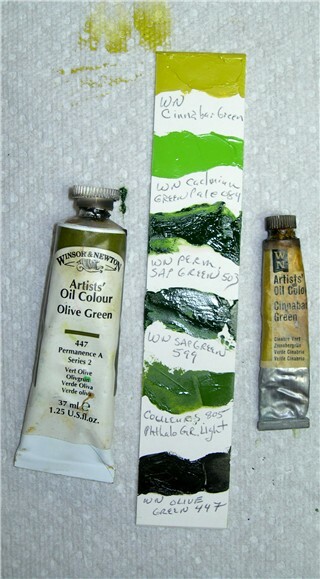 Out of 140 tubes of paint, all but about twenty had not been opened for at least ten years, some for over twenty years. With matches and a pair of pliers I was able to open all but two. The awl was helpful when the paint had hardened, creating a plug at the opening of the tube. Only three tubes of paint required the use of the awl. 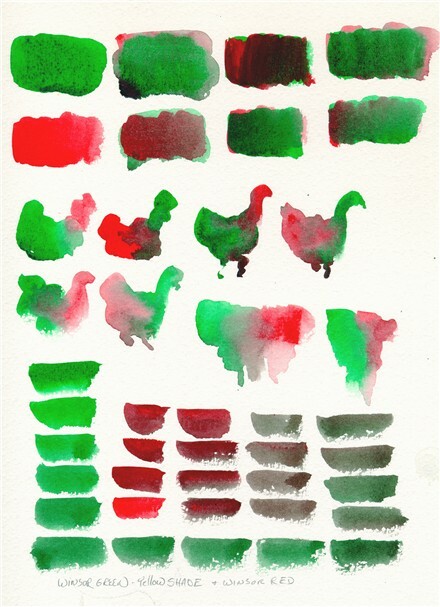 This method may be used with oil, watercolor, acrylic, casein, gouache, etc. I find wooden matches to be better for the job than the cardboard matches. They burn longer and are easier to strike. By holding the flame beneath the tube at the base of the cap and rotating the tube over the flame, the paint becomes softened and the cap, with the help of the pliers, can be loosened. 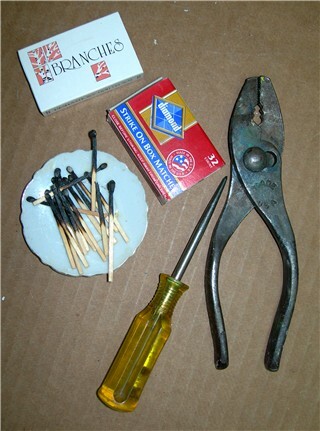 Some tubes require two or even three matches. Turn the cap firmly but gently or the tube might give way before the cap and paint will squirt out from the crack in the tube. When this happens, I wrap the tube in plastic wrap or keep it in a zip-lock bag to prevent it from hardening. 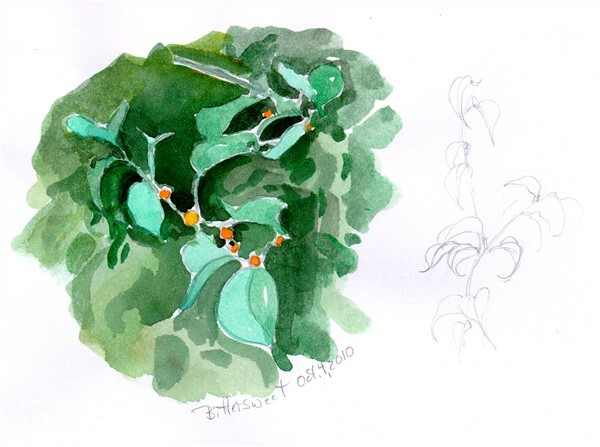 Two delightful discoveries during the continued Color Value Chart painting session (Color Exercise #4) were Cinnabar Green and Olive Green. Cinnabar is a beautiful, light value yellow green. Olive is almost black. Two other discoveries in the almost black category were Purple Lake and Indigo. Another example of drastic differences between pigments can be seen by the example below of the swatches of Cobalt Violet. Cobalt Violet manufactured by Winsor Newton is quite cool whereas the Cobalt Violet manufactured by Couleurs is rather warm. Notice that the pigment by Couleurs is labeled “light hue”. “Light” and “hue” are clues that the pigments will be different, even if the pigments are created by the same manufacturer. It is important to make color swatches to have a record of both the value and the temperature of your pigments. Exercise 3: Exploring Color Value and Temperature has now been posted. You may also view the exercises by clicking on the Color Exercises link at the top of the page or by clicking on the links located on the bar to your right.